Ketchup and mustard are staples of summer. I cannot imagine a summer without them. Life would become very boring. Yes, our hot dogs and hamburgers and sausages would be edible, but boring. We need our mustards, ketchups (or is it catsup) and relishes. Where would we be without our chopped onions on the hot dogs, or slices of tomato and onion on hamburgers? And, if you are like me, a sausage on a roll is bland until you slather it with onions and peppers. Today, we’ll talk about ketchup and mustard. They are both plant-based and you could, if you had the patience, create them from the vegetables in your garden, at least some of them. But then, it is so much easier to stop by the supermarket and select our needs, though you would miss the satisfaction of “I made it myself,” and in many cases they would taste better. Let’s start with mustard. I think that it is the most complicated of all the condiments because of all the possible additives and the fact that it is made from the seeds of the mustard plant. To start with, most of our domestic mustards originate from white or yellow seeds. But then, we often see it made from the brown or Indian seeds. And to make matters more complicated, we have black mustard seeds. Depending on the type, consistency or even the color desired, mustard seeds are used whole, ground, cracked or even bruised, and are mixed with water, various vinegars and wines. After thorough mixing to the consistency desired, salt, pepper and various other spices are added and, with careful combining, the manufacturers come up with the color, from bright yellow to a dark brown. And while we think of it as a flavor to slather over our hot dogs or hamburgers, there is a whole other side to mustard. Think about adding a tablespoon or two to your next salad dressing, or to add flavor to your next sauce or soup. It can really add a lot of flavor — I call it “zing” — to the final dish. 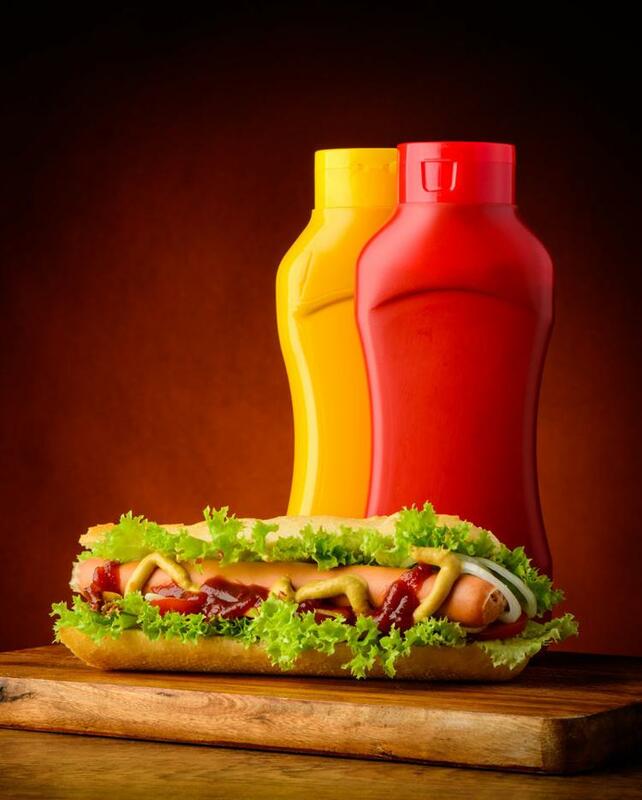 One advantage of mustard over other condiments is that it does not have to be refrigerated. It will not grow mold or bacteria or other nasty things so long as it is capped and kept at room temperatures. However, in time, it will lose some of its flavor and turn brown from oxidation. Let’s look at the choices we have in ketchup. In days of yore, in merry olde England, it could be made from a combination of many products and often contained egg whites, mushrooms, oysters and walnuts, among other things. But then, our tastes became quite refined, and a gentleman in Pittsburgh, Pennsylvania, began mass-producing the ketchup we know today. He simplified the recipes. To this day, the Heinz label is on 60 percent of the ketchup sold in the U.S. It holds more than 80 percent of the share in the United Kingdom. Ketchup can be described as a sweet and tangy sauce made from tomatoes, sweeteners and vinegar, with various spices and seasonings. However, when we talk ketchup here in Auburn, we are talking about just that — a simple variation. But in different parts of the world, and indeed in different states here in the U.S., the sauce might be laced with onions, allspice, coriander and even garlic, mustard, cinnamon or ginger. Some time, be brave and get yourself a bottle of one that you have never tried before. I will bet that you will be very surprised. Here is a recipe I recently stumbled upon. It goes back two centuries, to 1817. Gather a gallon of fine, red, fully ripe tomatoes. Mash them with a pound of salt. Let them rest for three days. Then press out the juices. To each quart, add a quarter pound of anchovies, two ounces of chopped shallots and an ounce of black pepper. Now boil it all for half an hour and strain off the juices. Add a quarter-ounce each of mace, allspice, ginger and nutmeg, along with a dash of coriander. Simmer for 20 minutes and strain through a bag when cool. Now bottle it, adding a wine glass full of brandy. It will keep for seven years. Now, that is my kind of ketchup. This entry was posted in Garden, Herbs, Plants and tagged Auburn NY, Cosentino Florist, Garden, horticultural, Plants. Bookmark the permalink.